Slice the onions into quarters and put them in an ovenproof dish with the butter. Strip the thyme leaves from the stem and sprinkle over the onions with salt and pepper. Then add the red wine. Cook over hot coals for about 45 minutes until tender. Add the parmesan cheese and cook for another 15 minutes. 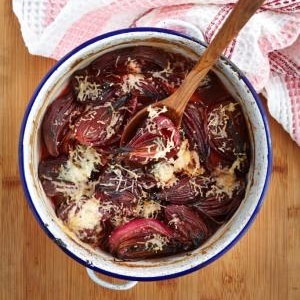 (You can also bake the onions in an oven at 180 °C in an open dish). Serve with your braai meat and a warm French loaf.